I had a lot of fun making short videos for a few of the songs from Gentle Hands! This one features the title song, which is sung to the tune of Frere Jacques. 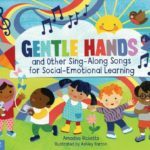 The songs are easy to sing and remember whether you are at home, in a classroom, or at the library. The book will be released on May 15, and you can preorder a copy at freespirit.com or wherever you like to buy books.